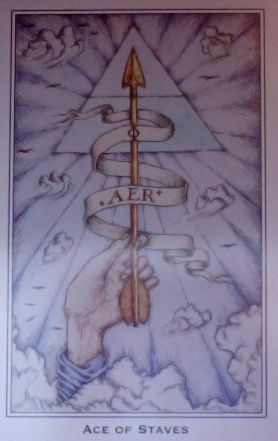 Weekend Reading: Ace of Staves from the Nigel Jackson Tarot. You may recall this is the second time we've had this exact card this week. It's urging us to get to the root of our thoughts and to get to the point in conversations. Dilly dally and deny some other time. This weekend you really need to take the direct route to the heart of the matter or in making your voice heard. That doesn't mean to be rude or cutting. But instead of relying on others to read your mind or read between the lines, let them read your lips.